August 23, 2018 – Wayne Dalton, a premier manufacturer of garage door solutions for the building industry, has been selected as a finalist for its Luminous™ all-glass, frameless style garage doors in the windows and doors category of the Architizer A+Awards, the largest awards program in the world dedicated to honoring the year’s best architecture, spaces and products. “This award pays tribute to Wayne Dalton’s dedication to ingenuity. Wayne Dalton has been able to create a garage door that seamlessly flows between indoor and outdoor spaces and integrates with the aesthetics of any commercial or residential structure for an ultra-modern, frameless look,” said Wayne Dalton Brand Manager Sarah Schram. Now in its sixth year, the A+Awards receives entries from more than 100 categories were judged by a panel of 400 members of the architecture and design community, as well as prominent leaders from industries such as art, technology, fashion, media and real estate. Official sponsors of the Architizer A+Awards include The Wall Street Journal, WSJ., Phaidon, American Institute of Architects’ San Francisco and New York Chapters, Royal Architectural Institute of Canada, The Society for Marketing Professional Services and The Boston Society of Architects. 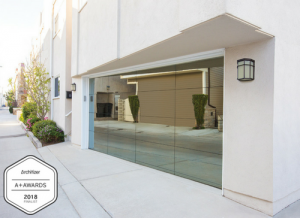 Available for residential (Model 8450) and commercial (Model 464) installation, Luminous garage doors are built-to-order and can be customized in five glass finishes (Opaque White, Opaque Black, Mirrored Gray, Mirrored Bronze and Translucent Black) and five frame finishes. They are ideal for restaurants, modern homes or any application where a sleek, easy maintenance door is desired. Wayne Dalton, a division of Overhead Door Corporation, is a world-class designer and manufacturer of residential and commercial garage doors. Wayne Dalton is known as a proactive business partner for its dealers, providing a wide breadth of innovative, easy-to-install products and smart sales tools to help grow their business. For consumers, Wayne Dalton simplifies the purchase process by providing a full range of doors and styles through conveniently located dealers. For more information, visit wayne-dalton.com. Architizer’s core mission is to Empower Architects, via its new marketplace connecting architects and building product manufacturers, and via its inspiring content, awards program, and global reach spotlighting the world’s best architecture. Architizer connects architects with the tools they need to build better buildings, better cities, and a better world.